Notes: This is a fairly acidic salsa, but was tested with a wide variety of tomatoes, peppers and onions to ensure the necessary acidification for boiling water canning and still allow for some consumer choice in the ingredients. The peppers used may be sweet bell peppers (of any color) and/or hot peppers. The purpose of the commercially bottled lemon or lime juice is to standardize a minimum level of acidity in the recipe. For the purposes of our testing, we used lemon juice as it was deemed the most acceptable flavor for the proportions in this particular recipe. For safety reasons, do not substitute vinegar for the lemon or lime juice. Do not use bottled key lime juice. 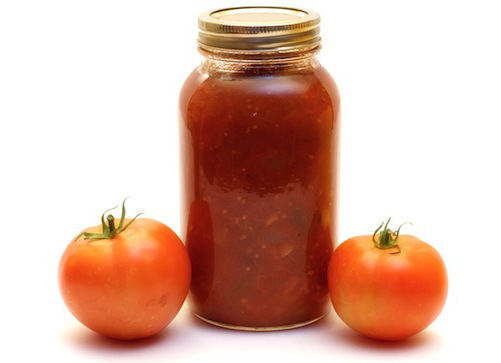 Do not alter the proportions of tomatoes, vegetables and acid because that might make the salsa unsafe when this canning process is used. The chopped tomatoes and diced peppers and/or onions are to be measured level in dry measuring cups; the lemon or lime juice is measured in a liquid measuring cup. We did not test other vegetables for flavor or acidity. 1. Wash and rinse pint or half-pint canning jars; keep hot until ready to fill. Prepare lids and ring bands according to manufacturer’s directions. 2. Dip washed tomatoes in boiling water for 30 to 60 seconds or until the skins split. Submerge immediately in cold water. Peel off loosened skins and remove cores. Remove seeds and chop (¼- to ½-inch pieces). 3. Peel, wash, core and dice onions (¼-inch pieces). 4. Wash and core bell peppers. Remove the seeds and membranes before dicing (¼-inch pieces). 5. Wash and remove stems of hot peppers. Keep or remove as much of the seeds and membranes as you wish, depending on the ‘pepper heat’ of the salsa that you desire. Dice peppers (¼-inch pieces). 6. Combine prepared ingredients in a large pot; add lemon juice and salt. Bring to a boil over medium heat while stirring. Reduce heat and simmer salsa for an additional 3 minutes, stirring as needed to prevent scorching. 7. Fill the hot salsa into prepared hot jars, leaving 1/2-inch headspace. If needed, remove air bubbles and re-adjust headspace to ½-inch. Wipe rims of jars with a dampened clean paper towel. Adjust lids and bands. Refrigerate any leftover salsa after filling jars, and enjoy freshly made! Refrigerate the canned salsa once jars are opened for use.